The main obstacle is inertia: politicians continue to favor the fossil-fuel industry and traditional agriculture mainly because they don’t know better or are on the take. Reaching net-zero emissions by mid-century, followed by negative emissions, would likely secure the goal of limiting global warming to 1.5 degrees Celsius relative to Earth’s preindustrial temperature. Alarmingly, warming has already reached 1.1 degrees Celsius, and the global temperature is rising around 0.2 degrees Celsius each decade. That’s why the world must reach net-zero emissions by 2050 at the latest. The shift toward clean energy would prevent hundreds of thousands of deaths each year from air pollution, and the shift to healthy, environmentally sustainable diets could prevent around ten million deaths per year. A low-cost shift to clean energy is now feasible for every region of the world, owing to the plummeting costs of solar and wind power, and breakthroughs in energy storage. The total system costs of renewable energy, including transmission and storage, are now roughly on par with fossil fuels. Yet fossil fuels still get government preferences through subsidies, as a result of incessant lobbying by “Big Coal” and “Big Oil,” and the lack of planning for renewable alternatives. The key step is a massive increase in power generation from renewables, mainly wind and solar. Some downstream energy uses, such as automobile transport and home heating, will be directly electrified. Other downstream users -- in industry, shipping, aviation, and trucking -- will rely on clean fuels produced by renewable electricity. Clean (zero-emission) fuels include hydrogen, synthetic liquids, and synthetic methane. At the same time, farms should shift toward plant-based foods. Asia’s continued construction of coal plants, together with ongoing deforestation in Southeast Asia, Africa, and Brazil, is putting our climate, air, and nutrition at huge and wholly unnecessary risk. In the United States, the Trump administration’s promotion of fossil fuels, despite American’s vast renewable-energy potential, adds to the absurdity. So does the renewed call by Brazil’s new populist president, Jair Bolsonaro, to develop -- that is, to deforest -- the Amazon. Governments and utility commissions should require that all new power-generating capacity is zero carbon. As old fossil fuel plants age and are shut down, they should be replaced by clean power generation on a competitive basis, for example through renewable-energy auctions. China and India, in particular, should stop building new coal-fired power plants at home, and capital-exporting countries like China and Japan should stop financing new coal-fired plants in the rest of Asia, such as Pakistan and the Philippines. Private sector firms will compete intensively to lower still further the costs of renewable energy systems, including power generation, energy storage, and downstream uses such as electric vehicles, electric heating and cooking, and the new hydrogen economy. Governments should set limits on emissions, and the private sector should compete to deliver low-cost solutions. Government and business together should finance new research and development to drive costs even lower. Consumer foods are going another way. The big news is that Burger King, in a new venture with Impossible Foods, is moving toward plant-based burgers. Impossible burgers taste just like beef burgers, but smart chemistry using plant-based ingredients allows burger lovers to savor their meal while saving the planet. 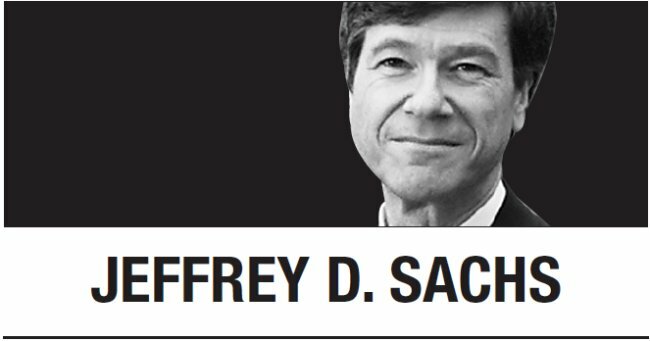 Jeffrey D. Sachs, professor of sustainable development and health policy and management at Columbia University, is director of Columbia’s Center for Sustainable Development and the UN Sustainable Development Solutions Network. -- Ed.